A new breed of indie artist meets radio. Short, free programs made for internet radio! Click the picture to order. Stations may request a free download of any song. 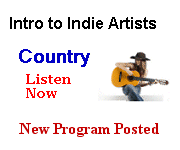 Free subscription to "Intro to Indie Artists" Country. How Long Does a Woman Have to Wait? Hours of RRadio Music are Here.